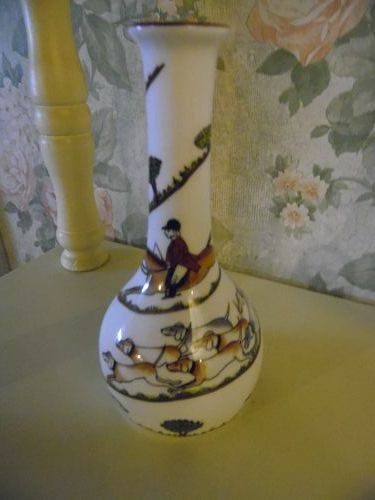 Fine Crown Staffordshire china 'Hunting Scene' Bud Vase for the discerning collector, made in England. 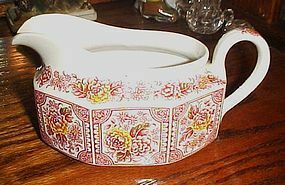 Measures 5 3/4 inches tall x 2 3/4 inches wide. 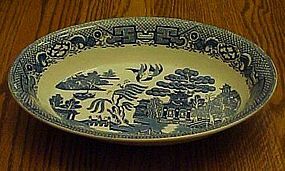 In excellent condition with no chips cracks or restoration. 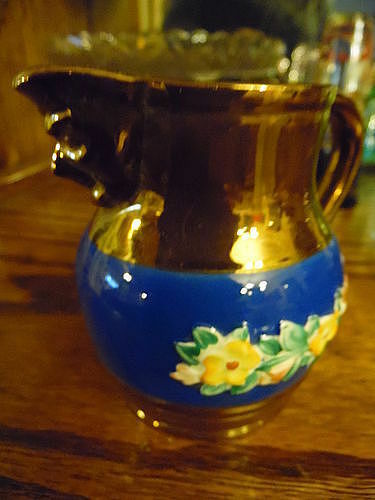 This same vase is near $90.00 on a popular replacement website. Antique Crown Staffordshire England fine bone china demitasse creamer and lidded sugar. 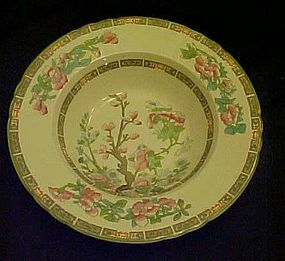 Color of the china is yellow with pink roses and accented with gold trim. I think this yellow was called pan yellow. Sugar with lid is 2&3/4" tall and creamer is 2" tall. In excellent condition. Just in time for the holiday table. 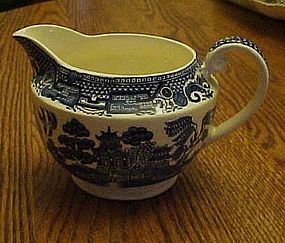 This nice Canterbury gravy boat made by Ridgeway Staffordshire England. 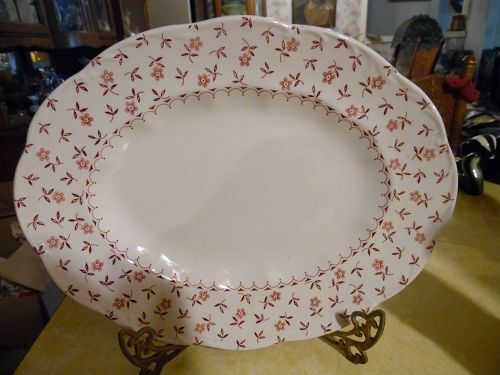 Pretty floral transferware pattern. Pristine condition. Never hurts to have an extra one at the other end of the table for the holidays. Measures3 3/8" tall to the top of the handle and is 7 1/4" long. 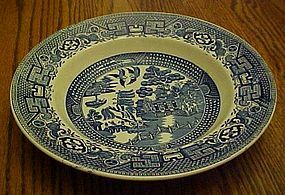 Myott Staffordshire Indian tree rimmed soup bowl 8"
Indian tree 8" rimmed soup bowl made by Myott Staffordshire England. This has the gentle scallop with green edges. 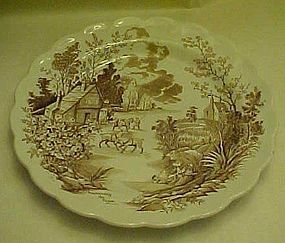 I have 3 available, and all are in great condition with no stains, chips or cracks. 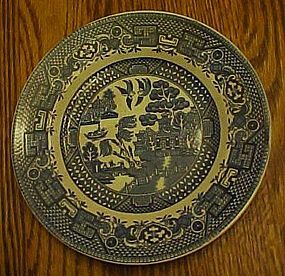 There is however some crazing underglaze. I have 3 available. Price is for each. 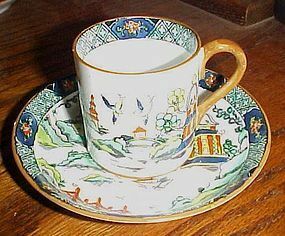 Full size cup and saucer made by Royal Staffordshire, Liberty, J&G Meakin, England. 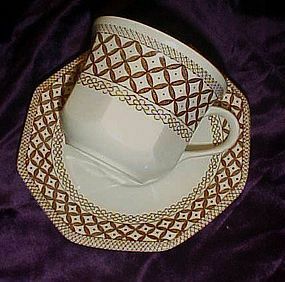 Eight sided cup and saucer in the wicker brown pattern. Excellent condition, with no damages or crazing. I have 3 sets available. 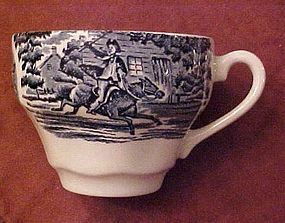 Price is for 1 cup with its matching saucer. 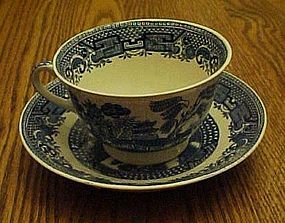 Beautiful bone china bell in the bluebell pattern by Crown Staffordshire.There is also a bluebell on the handle, I just noticed I did not photograph the front side of the bell. The precious dinner bell measures 5 1/4" tall and is in pristine condition. 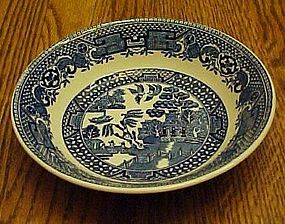 Bone china clapper too. Gives a delicate ring. 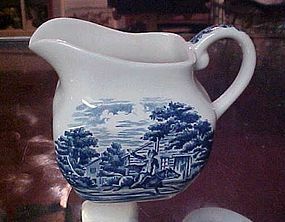 This bell is perfect, and would make a wonderful quality addition to your bluebell dinnerware, or bell collection.